Not much achieved in the past couple of weeks, not sure why to be honest. Started a new WIP on 23rd and actually haven't picked it up since so this is all I have. Sublime Seaside cardigan, size 16", knitted in Sirdar Calico again, hopefully I'll have enough. 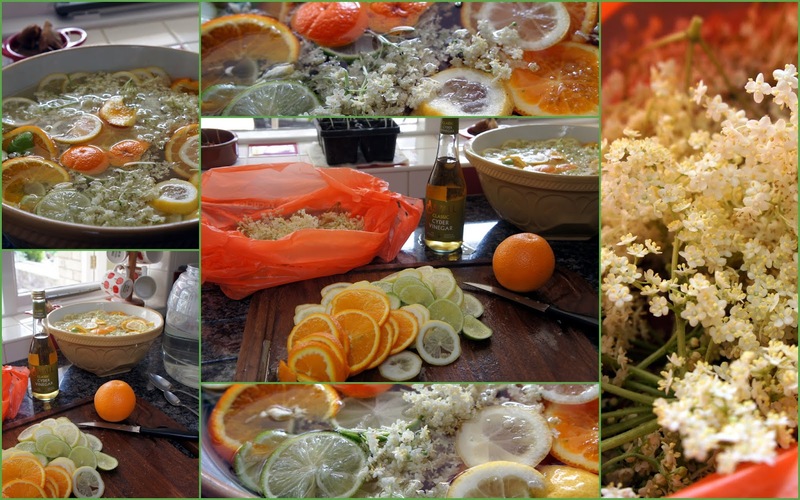 A non knitting WIP is a couple of batches of Elderflower Cordial - takes 4 days of steeping, then bottle and freeze till needed. Great with soda and or vodka! Current reading material - Water for Elephants by Sara Gruen only about quarter of the way through so undecided as yet. Oh that Cordial mix looks divine. Sometimes there are just other things happening, no worries! Anyway you've been keeping us entertained with your travel tales and I'd consider that wip too! Water for Elephants got a lot of press and was super popular for a time at the library where I work. Personally I liked her book "Ape House" more. Oh I like the sublime cardigan. I always forget to knit baby items in white or cream. Your elderberry cordial looks very interesting. Hope it tasted nice! The sweater pattern looks great. That will be a darling little cardigan! Preparing the cordial looks like hard work but, from what you write, is worth it in the end!